The handmade Oval White Marble Dining Table Top is made by artisan Amir. No Colors Used, All You are admiring is natural semi-precious stones. This Pietra Dura Marble Inlay table top is a replica of ancient Italian Design is of 79 x 125 cms are molded and polished. 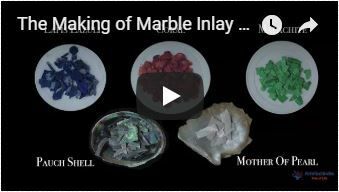 Different types of semiprecious and rare color stones like Paua Shell and Mother o Pearl used to inlay. The Oval White Marble Dining Table is made in Agra India & fully handmade.